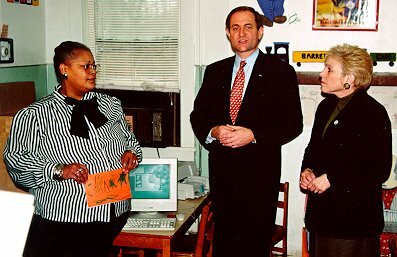 Two years ago, when he was attorney general, James S. Gilmore III visited Barrett Day Care Center "and learned from director Cindy Stratton that it could use a new computer." Gilmore said he would find the day-care center a computer. On January 12, 1998, he and his wife, Roxane, "delivered a new IBM Aptiva with Hewlett Packard printer donated by Circuit City. 'It seems to me that every child ought to be able to be introduced to this at an early age,' Gilmore said. 'I wanted to fulfill a promise and give you something to work with" (Bob Gibson, The Daily Progress, January 13, 1998).